The next morning, I awoke early with the intention of photographing the promenade from the opposite end. I set up my tripod before the sun was up and with the moon still visible. June 2016, panorama from 3 horizontal images, additional exposures for highlights, focal length 30mm, aperture f/11, shutter speed 6 seconds, ISO 64, tripod. Lloret de Mar is regarded — somewhat unfairly — as a contrived town built solely for the purpose of attracting tourists. It’s true that the area reigns supreme in the world of packaged holiday tours, and for that reason, its image suffers in comparison to other, more authentic Spanish towns. But I found LLoret de Mar and the whole of the Costa Brava unfailingly lovely. I was charmed by its wooded coves, rocky cliffs, and walled medieval towns. I found that beneath the tourist-friendly veneer is a region rich with history and culture, as well as abundant natural beauty. I don’t think it’s at all coincidental that the area inspired two of the twentieth century’s great artists — Salvador Dali and Pablo Picasso. It was an uncommonly cool morning for summer when I prepared for the shot. The early hour and the full moon, still visible, gave the shot a blue-hued, mystical quality, a very different view of the town than one normally sees. 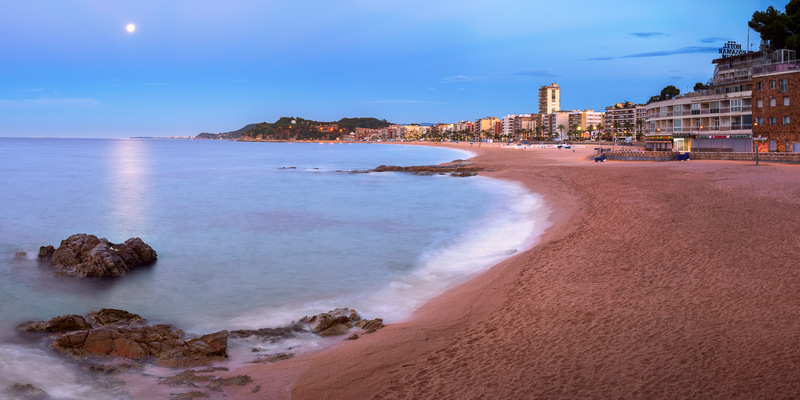 I again used a panoramic shot to capture the expanse of Lloret de Mar’s lovely promenade. This entry was posted in City and tagged Catalonia, Lloret de Mar, Spain.